Following the dismissal of the United Nations Mission in South Sudan (UNMISS) commander, Lt. Gen. Johnson Ondieki, the Kenyan government reacted angrily by swiftly calling for the withdrawal of the Kenyan forces from the mission in South Sudan 'with immediate effect.' The Kenyan government, in a strongly-worded polemic, also called for disengagement from the South Sudanese peace process. “I say now that we will discontinue our contribution of troops to the proposed regional protection force....we will no longer contribute to a mission that has failed to meet its mandate and which has now resorted to scapegoating Kenyans," Kenyatta has said. While Kenyan President, Uhuru Kenyatta, supported the withdrawal of the Kenyan troops from UNMISS, Moses Wetangula, one of the principal leaders of CORD, told a press conference in Bungoma, where he's also the senator, that it's only the Kenyan parliament that can authorize the withdrawal of the troops from UNMISS. ''I want to tell you, Uhuru, that before those troops went to South Sudan the matter went through Parliament. If you want them out of there return it to Parliament and see what MPs have to say," Wetangula said. Wetangula said that Kenya has a strong interest in bringing peace to South Sudan and that the failure of one Kenyan isn't a ground for all the troops, who are doing a valuable job as they've always done, to be withdrawn from a life-saving mission. 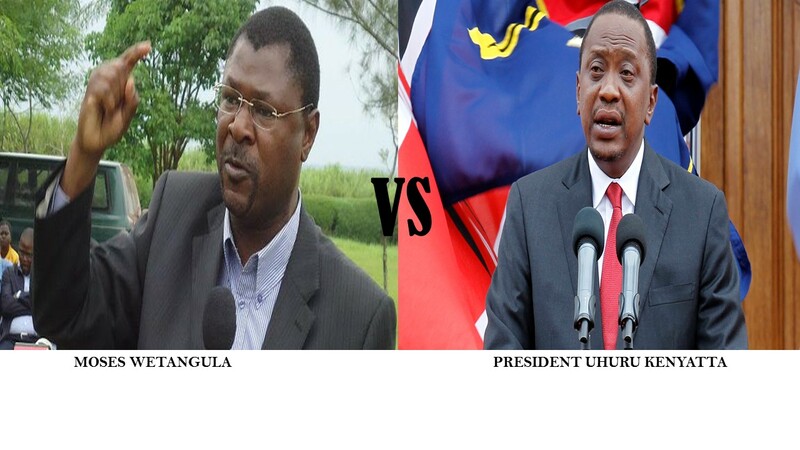 Wetangula accused Uhuru of acting out of pride and emotion. "This is not a matter to decide on your own based on personal emotions and pride. Kenyans are not aggrieved by a general being sacked by the UN but are proud to see the 6,000 minus one troop bringing peace to South Sudan," he added. The senator lauded the contribution of the Kenyan Defence Force (KDF) adding that Kenyan troops are contributing toward the security of the region and the international community. Given the fact that Kenya has a well-developed bureaucratic, democratic and political system, it's not clear why Uhuru's government acted in such a unilateral manner without any consultation required by democratic governance. Kenya isn't only the region's economic and tech powerhouse, it also houses many of the region's humanitarian headquarters given its relative stability and the strength of its institutions. Uhuru's action can tarnish the nation's status regionally and internationally. Uhuru's emotional reaction also resulted in the deportation of South Sudanese rebel leader's [Riek Machar] spokesperson, James Gatdet Dak, to South Sudan. Gatdet had lauded the dismissal of General Ondieki by UN Secretary General, Ban Ki-Moon. Kenya didn't like Gatdet's reaction. Given the fact that Gatdet is considered an 'enemy' by Juba and could face persecution in there, Kenya has been criticized for having 'violated' Gatdet's human rights.